Color coated aluminum coil refers to the surface of aluminum coil coloring treatment. Because of stable performance of aluminum alloy, it is not easy to corrosion. Because of its small density, high hardness, light material characteristics, color aluminum is a new building decoration materials in recent years. It has the characteristics of environmental protection, durability and beauty. Some of the advantages of some other products can not be compared. Color coated aluminum coil has the advantages of color uniform, bright and smooth, durable, strong adhesion, acid resistance, alkali resistance, corrosion resistance, weather resistance, ultraviolet radiation resistant and strong weatherability. 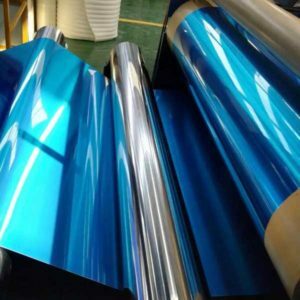 Polyester coating aluminum coil uses polymer containing ester bonds in the main chain as monomers, adding alkyd resin, ultraviolet absorbent according to gloss can be divided into sub light and high light series, especially suitable for indoor decoration and advertisement board. The fluorocarbon coating aluminum coil is made of fluorocarbon resin, pigment, alcohol ester solvent and auxiliary agent, which is made up of fluorine, fluorine and acetylene. After high temperature roasting, the molecular structure of the coating is compact, and it has strong weatherability. Fluorocarbon coating can be divided into traditional fluorocarbon and nanometre fluorocarbon coating, according to the surface film structure, which is especially suitable for the decoration and display of indoor, outdoor decoration, commercial chain, exhibition advertising and so on.